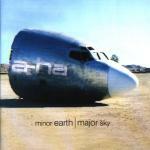 a-ha's album "Minor Earth | Major Sky" was released in Norway on Friday 14th April. It was released in other parts of Europe around 17th April and in the UK on 5th June. The album was also available in Japan on 10th May, Brazil on 18th May and Canada on 30th May. The album was released on both CD and cassette, but not on vinyl LP. In Germany and Norway, "Minor Earth, Major Sky" has already reached Platinum status and in Austria, Switzerland and Spain it has gone Gold. The album was produced by Boogieman and Rolan Spremberg, co-produced by a-ha and Kjetil Bjerkestrand with the exception of: "Thought That It Was You" by Kjetil Bjerkestrand, "I Won't Forget Her" by Boogieman and "Mary Ellen Makes The Moment Count" by Paul Waaktaar-Savoy. All songs were arranged by a-ha and mixed by Niven Garland, except for "Summer Moved On" and "To Let You Win" which were mixed by Boogieman. The album features backing vocals by Lauren Savoy on "You'll Never Get Over Me"; backing vocals by Simone on "Velvet"; drums by Frode Unneland on "Minor Earth, Major Sky" and "Company Man"; Sven Lindvall on bass on "Little Black Heart" and "Mary Ellen Makes The Moment Count"; Per Lindvall on drums on "Velvet", "Barely Hanging On" and "Mary Ellen Makes The Moment Count"; Per Hillestad on drums and Jørun Bøgeberg on bass on "You'll Never Get Over Me" together with the Vertavo Quartet. Strings were arranged by Paul / Magne with Kjetil Bjerkestrand and played by members of the Oslo Philharmonic Orchestra and the Norwegian Radio Orchestra. The cover of the regular CD release features a picture of an aeroplane's cockpit photographed by Bjørn Opsahl in a desert outside Las Vagas. a-ha has been printed on the side of the cockpit in large letters. The album title has been placed over the 'sand' underneath the cockpit. The CD booklet includes the song lyrics (some of which do not match the lyrics sung!) and around eight colour pictures of the band / individual members by Bjørn Opsahl. 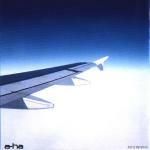 The reverse of the booklet features a picture of an aeroplane wing against a blue sky. The a-ha logo has been placed in the bottom left hand corner and the catalogue number in the bottom right hand corner. The background image of the back cover shows part of the metallic body of the aeroplane's cockpit. The tracks are listed in a white font. Some of the words in each song title (or part of the word in the case of "Velvet") are printed in a larger font. Beneath the tracks are individual shots of Morten, Magne and Paul, plus additional white text. The spine uses a cross section of the sky and sand taken from the cover picture with titles in black. The top half of the disc is light blue and the bottom half is a beige colour. A black line separates the two colours. The silver a-ha logo is placed in the top half of the sleeve, while the tracks are printed in black at the bottom. Again, the tracks have been printed using variable sized fonts. The CD tray is transparent, through which you can see the picture of the aeroplane's cockpit. The picture is the same as that on the cover of the album, but the a-ha logo has been omitted from the side of the cockpit and information about the official web site and management replaces the album title over the sand. As well as the regular release, there also exists a German made limited edition release. It is believed that this release might well be a bootleg release due to the fact that the track "Barely Hanging On" is misspelt as "Barley Handing On" on both the back insert and disc. Also, this "limited edition" takes on the same catalogue number (but different barcode??) as the regular edition, rather than having its own unique number. Another factor is that the colours and sharpness of the fonts on the sleeve are inferior to the regular release. In addition the back insert and disc include a "Polo Music" logo which could be a logo of the manufacturers. Official or not, this item is, never-the-less, nicely presented. In addition to the 13 tracks of the regular release, it includes the five bonus tracks: Crying in the Rain (4:23), Early Morning (2:59), Hunting High and Low (remix) (3:48), Take On Me (3:48) and Summer Moved On (Remix) (6:00). Total running time = 79:43. The limited edition comes with a 4-page fold-out front sleeve. The front of this sleeve is almost identical to the regular release, but at the bottom it states that it is a "limited edition" and "this cd also contains 5 bonus tracks". The reverse of the sleeve is also identical to its regular counterpart. Inside the fold-out sleeve are four pictures taken from the booklet of the regular release but with the lyrics printed over the top. The lyrics are prnted in blocks so as to avoid covering the faces of the band members. The back-insert is identical to the regular release, apart from the obvious difference in the track listing with the inclusion of the five "bonus tracks". The spine has the additional text "limited edition". The disc is also similar to the regular release, but with additional text listing the bonus tracks. "limited edition" is also printed at the top of the disc, below the a-ha logo. As with most albums, there was a promo copy issued. It comes in a blue and white wea sleeve. The top section of the sleeve is white with several small blue wea logos scattered around. The bottom section of the sleeve is light blue with the tracks printed in black and a wea logo faded into the background. Across the sleeve are some white and black boxes with a-ha, the title and "promotional copy not for sale" printed within. The disc is light blue and silver - of similar design to the front sleeve. The track list and other text is printed in black in the bottom section of the disc with a-ha and the title printed inside respectively silver and black boxes at the top. The tracks are recorded in the same order as on the regular release. The CD comes in a slimline jewel case. At least two different promo CD-R's of the album were available. One comes with a white sleeve which has A-HA and the title printed in large letters at the top of the sleeve and the track listing underneath. The other, German made, promo also has a silver disc with black text. 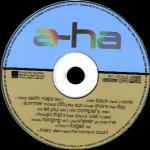 "a-ha" and the title are printed at the top of the disc. The WEA-logo and standard compact-disc logo are respectively on the left and right sides of the disc. The following text is printed at the bottom of the disc: "WEA Records Germany FOR PROMOTION USE ONLY!". The CD comes with a frontsleeve and a back insert. The front-side of the front-sleeve is a black and white copy of the disc itself, on a black background. The reverse of the front-sleeve has the grey outline of a CD as background image. Over the top of this CD, the tracks are printed with a-ha plus title above. The WEA and the compact-disc logos are placed in, respectively, the bottom left and bottom right corners. The back-insert is almost identical to the back-side of the front-sleeve, except that the grey CD-image is missing and the additional text "WEA Records Germany FOR PROMOTION USE ONLY!" has been printed at the bottom. The tracks have been recorded in the same order as they are on the promo disc listed above. The track are listed in a similar way to the promo above, except for "I Thought That It Was You" which is printed as "Thought That It Was You", as on the regular album release. The given track lengths also differ slightly from the regular release. There is promo "press pack" of the album which comes in a blue carboard boxed sleeve (approx. size when closed: 29cm x 13cm) with "a-ha" printed on the front in embossed silver letters. On the reverse, track information is printed in white text. 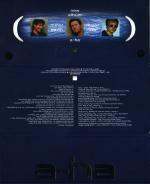 The sleeve opens out to reveal individual shots of the band memebers (Morten, Magne and Paul) which have been placed in a row above a blue and white "sky" image. "new album" and "a-ha" are printed respectively above and below the picture of Magne, whilst "minor earth" is printed between Morten and Magne and "major sky" between Magne and Paul, all of which are in white letters. Two white "moon shape" cut-outs can be found at either end of the row of pictures. They don't seem to have any function, since the box seals with the help of velcro. The promo pack hasn't been given a catalogue number. Inside the box there are two discs which sit side by side in black trays, one is a promo copy of the album, the other is a CD-Rom featuring a bio, photo's, discography, interview and video message. Both discs are silver with black text. "On March (note: the German text suggests 27th March as the date, but the English side just says March! ), a-ha will release the single »Summer Moved On«, to be followed by the album »Minor Earth Major Sky« on April (note: again the German side gives the exact date of 17th April). This is the first new music from the Norwegian trio since 1993 and marks the beginning of a new chapter in the a-ha saga. After having enjoyed massive international success in the 1980's, the three members of a-ha - Morten Harket, Pål Waaktaar and Magne Furuholmen - spent much of the following decade working on individual projects, ranging from Furuholmen's acclaimed paintings to Waaktaar's band with his wife Lauren Savoy. »We needed to establish ourselves on our own terms«, the band says of the time spent apart from each other. Having done just that, the three now bring a whole range of new elements and qualities to »Minor Earth Major Sky«. While their melodies and arrangements are as lush and majestic as ever, the band's growth and evolution is evident in ways both subtle and obvious throughout the album's x songs. «Having had the sort of success we've had, we don't really have anything to prove in the commercial sense,« feels Morten Harket. ..Rather, this is about us finally proving what we're capable of as artists and musicians. »And the astonishing thing is that, in every way you could think of, we're simply better than ever...« "
The cassette edition of the album has similar sleeve design to the regular CD release. 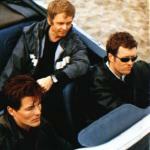 The reverse of the insert features a faded picture of a-ha (Morten, Paul and Magne) sitting inside an open top car. Information about the tracks and production are printed over the top in white letters, but the song lyrics have not been included. The actual cassette is transparent / grey with white titles. The CD release is virtually the same as the European release and includes the same colour lyric booklet, it comes with a silver "FLAP F" hologram sticker on the front of the case. The Warner Music Argentina Manufacturing, Distributing and Copyright information is printed in Spanish on the back sleeve;"℗ & © 2000 WEA RECORDS Warner Music Germany • A Warner Music Group Company. Publicado y distribuido por Warner Music Argentina S.A. Miembro de CAPIF. Reservados todos los derechos del productor, de los autores y de los interpretes de las obras reproducidas en este ejemplar. Prohibida la reproduccion, regrabacion, alquiler, prestamo, canje, ejecucion publica, radiodifusion y cualquier uso no autorizado de estos fonogramas. SADAIC-BIEM/AADI CAPIF INDUSTRIA ARGENTINA. Si tiene alguna denuncia sobre pirateria llame gratis al 0-800-333-4275". The regular white"WE" logo is also shown along with the"COMPACT disc DIGITAL AUDIO","WARNER MUSIC ARGENTINA" and"Das Ende vom Lied. COPY KILLS MUSIC" logos. 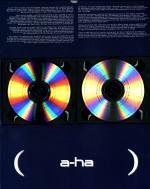 The disc itself is coloured the usual half light blue at the top and cream at the bottom, the regular a-ha logo is shown in silver with the varied font track listing in black displayed on the lower half. On the left hand side, only the"wea" and"WARNER MUSIC ARGENTINA" logos are present and doesn’t include the regular"℗ 2000 WEA RECORDS, Warner Music Germany GmbH" text. The usual catalogue number 8573 82183-2,"GEMA/BIEM" and"COMPACT disc DIGITAL AUDIO" logos, plus"LC 04281" coding is also printed, which is exactly the same as on the European edition. Around the outer edge of the disc is some Manufacturing, Distributing and Copyright information similar to the back sleeve which reads;"® 2000 WEA RECORDS Warner Music Germany. A Warner Music Group Company. Publicado y distribuido por Warner Music Argentina S.A. Miembro de CAPIF. Reservados todos los derechos del productor, de los autores y de los interpretes de las obras reproducidas en este ejemplar. Prohibida la reproduccion, regrabacion, alquiler, prestamo, canje, ejecucion publica, radiodifusion y cualquier uso no autorizado de estos fonogramas. SADAIC-BIEM/AADI CAPIF INDUSTRIA ARGENTINA". The promo Argentinian made CD edition comes with an additional red promo stamp on the disc which reads "DISCO PROMOCIONAL PROHIBIDA SU VENTA". There is no Silver"FLAP F" hologram sticker included on the front of the CD case. There was a vinyl LP of "Minor Earth | Major Sky" available. It is not confirmed whether or not this release is a bootleg. The first pressing is similar to the European release and comes with the same inner lyric booklet; it was "Manufactured by Videolar under license to Warner Music Brasil Ltda." and comes with an additional "FLAPF" silver hologram sticker on the front of the CD case. On the back cover, the "wea", "COMPACT disc DIGITAL AUDIO", "PRODUZIDO NO POLO INDUSTRIAL DE MANAUS CONHECA A AMAZONIA" flying bird and "DENUNCIE A PIRATARIA CD SO ORIGINAL disque Denuncia 0800-115751" anti-piracy logos are printed in a horizontal line under the barcode. There is also some Brazilian Production and Copyright information shown; "℗ & © 2000 WEA RECORDS Warner Music Germany . Warner Music Brasil Ltda. – Fabricado no Polo Industrial de Manaus por Videolar® S.A. – Av, Solimoes, 505 – Distrito Industrial – CNPJ 04.229.761/0004-13 – Industria Brasileira – Distribuido pela Warner Music Brasil Ltda. – CNPJ 42.470.112/0012-09". The disc itself comes instead with a pale light blue coloured top half displaying the usual silver "a-ha" logo and a creamed coloured bottom half (rather than the usual beige), showing the full track listing in the varied fonts and printed in black. The "wea" logo is displayed on the left hand side, but doesn’t include any additional production text, On the right, the catalogue number "857382183-2" and "COMPACT disc DIGITAL AUDIO" logo are included. Around the outer edge of the disc is some Brazilian Production and Copyright information; "℗ © 2000 WEA Records Germany. – Warner Music Brasil Ltda. – Todos os direitos reservados – Probida a execucao publica, radioteledifusao locacao – Fabricado por Videolar® - Industria Brasileira – Sob licence da Warner Music Brasil Ltda. CNPJ 42.470.112/0001-56". There is a second Brazilian pressing which was instead "Distributed by Sonopress under license to Warner Music Brasil Ltda. ", although very similar to the first pressing, the disc on the second pressing is coloured light blue and white, rather than the usual European blue and beige one. There are also other differences on both the sleeve and actual disc. On the back sleeve of the second pressing, it has the logos printed in a line vertically under the barcode and the record company and distribution information on the back sleeve has changed; "℗ & © 2000 WEA Records. Warner Music Germany. Warner Music Brasil Ltda. – uma empresa Warner Music Group. Produzido no Polo Industrial de Manaus e distribuido por Sonopress Rimo Ind. E Com. Fonog. S.A – Ind. Bras. Rua Ica, nº 100-A-Distrito Industrial – Manaus – AM – CNPJ 67.562.884/0004-91. Sob Licenca de Warner Music Brasil Ltda. – CNPJ 42.470.112/0012-09. Todos os direitos reservados. Proibida a reproducao, execucao publica e locacao desautorizadas sob as penas da lei. O prazo de validade do disco CD ou DVD e indeterminado desde que observado os seguintes cuidados: Armazenar em local seco, livre de poeira, nao export ao sol, nao riscar, nao dobrar, nao engordurar, nao manter a uma temperature superior a55°C e umidade acima de 60g/m3 e segurar o disco sempre pela lateral e pelo furo central. DISCO IS CULTURA. Denuncie a pirataria: [email protected]". As well as the colour of the disc differing, the second pressing also comes with the "PRODUZIDO NO POLO INDUSTRIAL DE MANAUS CONHECA A AMAZONIA" Amazon bird logo printed additionally on the left hand side of the disc, plus there is some different record company and copyright information displayed around the outer rim; "℗ © 2000 WEA Records Germany. Warner Music Brasil Ltda. Todos os direitos reservados, Proibida a execucao publica, radioteledifusao e locacao. Produzido no Polo Industrial de Manaus por Sonopress Rimo Industria e Comercio Fonografica S/A. lund. Bras. - CNPJ 67.562.884/0001-91 - Sob encomenda da Warner Music Brasil Ltda. - CNPJ 42.470.112/0012-09 uma empresa Warner Music Group". The second issue has some batch issue coding; AA0001000 which is printed in white in the centre of the disc and also on one of the spines. The regular inner lyric booklet is included. The cassette is similar to the German made release but comes with a silver "Б.А.М.П." hologram sticker on the front sleeve. The release doesn’t include the white barcode on the back sleeve and comes instead with some other Manufacturing information in its place; "Manufactured by Orpheus Music, a Warner Music International licensee". The Catalogue number 8573-82183-4 is also included. The regular Production and Copyright information at the bottom of the back sleeve has also been amended to omit the text; "Made in Germany by WARNER MUSIC MANUFACTURING EUROPE". The insert folds out to display the usual artwork pictures, full track listing in varied fonts and some credits information all printed in white. The tape is clear transparent with a grey centre piece and white printed text. The layout and font size of the text is virtually the same as the German made release apart from the square "wea" logo on the left hand side is slightly larger and side 1/2 on the right hand side being displayed slightly smaller. The title "A-HA / MINOR EARTH MAJOR SKY" with the track listing to each side is displayed as usual along the top. The Catalogue number 8573-82183-4 and "BIEM" only logo is shown on the left with "120 µs" and "DOLBY HX-pro B-NR" symbol on the right. Along the bottom of side 1 is some regular Copyright information and Manufacturing text; "All rights of the producer and of the owner of the work reproduced reserved. Unauthorized copying, hiring, lending, public performance and broadcasting of this recording prohibited!. Manufactured by ORPHEUS MUSIC, a Warner Music International licensee". Whilst along the bottom of side 2, it reads; "℗ 2000 WEA Records Company © 2000 Records Company". The Catalogue number printed at the bottom of the spine is the same as the German release WE 491 8573 82183-4. This Canadian promo of the album features a small shot of the regular album cover at the top of the disc. Additional text is printed at the bottom of the disc with the "wea"-logo on the right hand side. This promo does not come with a sleeve. It is not confirmed whether or not this is an official promo. The Chilean CD release comes with the regular front and back cover artworks displaying the picture of the cockpit and the black title "minor earth | major sky" at the bottom. At the bottom right hand corner on the back sleeve under the white barcode, there is some Chilean Production and Copyright information; "℗ & © 2000 WEA RECORDS Warner Music Group Company. All rights reserved. Unauthorized duplication is a violation of applicable laws. El Disco es Cultura". The catalogue number 8573 82183-2 // WE 739 is also shown but comes with a slightly different number compared to the European edition, plus the layout and design of the white "wea" logo has also been changed. The "LC 4281" coding reference and additional "Das Ende vom Lied. COPY KILLS MUSIC" symbol is included. 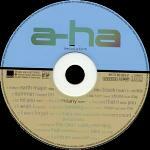 The disc comes with the regular format; light blue and beige separated with a thick black line in-between, the silver "a-ha" logo is shown at the top and black printed track listing at the bottom in varied fonts. On the left, the "wea" logo is shown but again displayed differently compared to the European edition, some production text is included; "℗ 2000 WEA RECORDS, Warner Music Germany GmbH. ℗ 2000 WARNER MUSIC CHILE S.A". On the right, the regular catalogue number 8573 82183-2, "LC 04281" reference coding and "COMPACT disc DIGITAL AUDIO" logo is shown. Around the outer top edge of the disc is some Spanish copyright information; "Reservados todos los derechos de las obras y del productor de fonogramas, prohibida la reproduccion, locacion y su radiodifusion o ejecucion publica. Ley 17.336". The release also includes the full colour lyric booklet which is exactly the same as the European edition. The Chilean cassette differs slightly compared to European edition. The front sleeve shows a larger cropped picture of the artworks chopping the front of the cockpit off. The lettering on the title "minor earth | major sky" is also displayed much bigger and nearer to the bottom of the sleeve. There is an additional "FLAP F" silver hologram sticker included on the front of the cassette case. The spine comes with a continuation of the artworks but has the title printed upside down compared to the European release, the lettering is also of a different sized font. At the top of the spine, there is in additional "wea" logo with the "DOLBY NR" logo, Catalogue number 8573 82183-4 and "Stereo" at the bottom. The back sleeve comes with a black background with white text; the full track listing for each side is displayed landscaped on the left hand side and down the middle. Side A and Side B are shown in Spanish as; "Lado A" and "Lado B". On the right hand side, a white barcode is included with some Production and Copyright information displayed underneath; "℗ & © 2000 WEA RECORDS Warner Music Germany • ℗2000 Warner Music Chile S.A. • A Warner Music Group Company. All rights reserved. Unauthorized duplication is a violation of applicable laws. El Disco es Cultura". The inside of the folded insert folds out and is longer and somewhat different compared to the European edition. The usual picture of the three band members sitting in a car is now shown to the right of the front and back sleeve with track credits information printed in black rather than the usual white. On the reverse of the insert, the picture used for the single; "The Sun Never Shone That Day" is shown on the left hand side, with the regular credits photo taken from the CD booklet showing the three band members looking into the ocean. The full track listing is also printed in white using the usual different fonts, plus some further credit information and same Production and Copyright text which appears on the back sleeve is shown. There is is round white "CV" logo shown on the inside of the spine displaying the text; "* PRINTED IN CHILE CLAUS VON PLATE F: 2091613", plus on the reverse of the back sleeve it displays some additional Spanish Copyright information and "DOLBY NR" text. The tape itself is transparent clear with a grey centre piece, The layout is again rather different compared to the European release, The title "a-ha minor earth | major sky" is displayed along with top with the full track listing to each side shown underneath. The "wea" logo and Catalogue number 8573 82183-4 is displayed on the left, with Side A/B and "STEREO" on the right. Along the bottom of Side A there is some Copyright information printed in Spanish; "RESERVADOS TODOS LOS DERECHOS DEL PRODUCTOR Y AUTORES DE ESTA OBRA GRABADA. PROHIBIDA SU REGRABACION Y SU UTILIZACION PARA LA EJECUCION PUBLICA Y/O RADIODIFUSION". Along the bottom of Side B, there is instead some Production and Copyright text; "℗ & © 2000 WEA RECORDS Warner Music Germany • ℗2000 Warner Music Chile S.A. • A Warner Music Group Company". The Colombian CD edition comes with the same artworks displaying the front of the cockpit on the front sleeve with the title "minor earth | major sky" in black underneath. The back sleeve as usual shows the track listing printed in white in varied fonts down the left hand side with the track lengths also included. At the bottom right hand corner, the regular white barcode is shown with the catalogue number "8573 82183-2//WE 833", plus "WEA" and "WARNER MUSIC COLOMBIA" logos. Some Spanish Production and Copyright information is additionally included; "℗ & © 2000 WEA RECORDS Productor fonografico para Colombia WARNER MUSIC COLOMBIA S.A. La reproduccion, copia, ejecucion publica, radiodifusion y/o distribucion estan prohibidas por las leyes Colombianas sobre derechos de autor. Hecho en Colombia". On the spine, the layout of the beige background colouring is rather lighter compared to the German made European release, plus the catalogue number has been printed as "8373 82183-2" instead of "8573 82183-2". The CD comes with the regular colour lyric booklet but all of the text including the track titles is somewhat smaller compared to the regular release, the Catalogue number of the back cover is again shown as "8373 82183-2". The disc itself is again coloured light blue on the top half with beige at the bottom, separated with a thick black line. The silver "a-ha" logo is printed above the centre ring with the full track listing as usual displayed in the varied fonts below in black. On the left hand side, the "WEA" logo is shown along with the text; "(P) 2000 WEA RECORDS", and on the right, the "COMPACT disc DIGITAL AUDIO" and "WARNER MUSIC COLOMBIA" logos are included. Around the outer edge of the disc is the same Spanish Production and Copyright text which appears on the back sleeve. 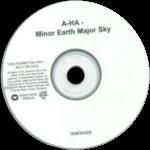 There is a promo CD-R of "Minor Earth Major Sky" by Warner Music Danmark A/S. It comes in a clear stickered sleeve. The disc is white with black text. 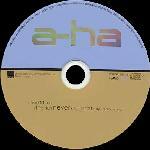 The a-ha logo and title are printed at the top of the disc. The WEA-logo, WARNER MUSIC DENMARK and standard compact-disc logo are respectively on the left side of the disc. The following text is printed left side of the disc: "FOR PROMOTION ONLY - NOT FOR SALE". At the bottom of the disc is the official WEA Number WMDK06. The tracks are in a different order compared to the regular release (in the same order as the European promo CD-Rs listed above). Some copies of the album sold in France have a large blue sticker on the front with "a-ha" in large white letters at the top and "Nouvel Album" plus catalogue number below. A promotional test WEA acetate CD-R was produced. It comes with a white paper insert with the a-ha, the album title and the WEA logo printed in black on the front and the tracks listed on the reverse. The tracks are listed in the same order as on the regular release, although "The Company Man" is listed as "Company Man". 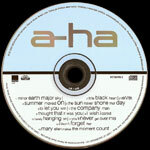 The disc is also white with a-ha, the title and WEA logo printed in black. The CD release comes with a similar front and back cover sleeve to the European edition but includes a plain white spine with black text rather than the continuation of the usual artworks. The regular Catalogue number 8573 82183-2 // WE 833 is shown and includes an additional number "WMI 153" alongside. There is some Indonesian Manufacturing and Marketing Information displayed on the back sleeve which reads;"℗ & © 2000 WEA RECORDS Warner Music Germany • A Warner Music Group Company. All rights reserved. Unauthorized duplication is a violation of applicable laws. Manufactured and Marketed by PT Warner Music Indonesia. A Warner Music Group". Also included on the front and back cover of the regular lyric booklet is an orange and light green leafed strip displaying"COMPACT DISC LUNAS PPN BARA" in orange text and"PROD : WARNER MUSIC NPWP/TH : 1.774.419.4-056 /2000" coded text in black. The disc itself comes with the light blue top half and beige instead of the usual cream at the bottom, both separated by a thinner black line. The regular silver a-ha logo is printed above the centre ring with the full track listing shown below in the varied fonts and in black. On the left hand side, the usual"wea" logo is included along with the text;"℗ 2000 WEA RECORDS, Warner Music Germany GmbH. Made in Indonesia". The Catalogue number 8573 82183-2,"GEMA/BIEM" and"COMPACT disc DIGITAL AUDI" logos, plus"LC0428" coding is shown on the right. Displayed around the bottom edge of the disc is some copyright information;"ALL RIGHTS OF THE PRODUCER AND OF THE OWNER OF THE WORK REPRODUCED RESERVED. UNAUTHORIZED COPYING, HIRING, LENDING, PUBLIC PERFORMANCE AND BROADCASTING OF THIS RECORD PROHIBITED". 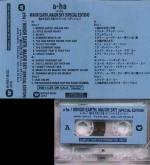 The cassette is similar to the European edition but has some additional Indonesia manufacturing information printed in small back letters along the edge of the back sleeve under the barcode; "MANUFACTURED AND DISTRIBUTED BY WARNER MUSIC INDONESIA. A WARNER MUSIC GROUP COMPANY". There is a light blue, green and yellow official "LUNAS PPN" leafed strip included on the upper side of the cassette case, plus some other additional numbers printed in black on the spine (HW 5680 at the top and the release date W.07.00 at the bottom). The actual tape is transparent clear with a grey centre and white printed text. The title "A-HA . Minor Earth Major Sky" with the track listing to each side shown underneath is displayed at the top but comes with a different layout and font size compared to the European release. The "wea" logo is shown on the left hand side with "Side A/B" and Catalogue number 8573-82183-4 included on the right. The Japanese release features extra material compared to the European release. It includes the remix of "Summer Moved On" plus an enhanced track which is the video for "Summer Moved On" (the video runs without the need of additional software). The enhanced track is not listed on the sleeve, but is mentioned on the obi strip and disc. It comes with a light blue and beige coloured obi-strip with black and blue titles plus Japanese lyric book. On the promo copy of the album, there is a white and red promo sticker on the back of the obi strip and the word "SAMPLE" (in orange) etched around the centre of the disc. Some copies of the promo have a large black and white sticker on the front which says (in Japanese) that a-ha are back with the new album (on sale 2000-05-10) after a long break and that the first single "Summer Moved On" is charting in Germany. Also that they would like assistance from record shops with this release and signed Warner Music Japan. A limited edition double CD set of the album was released in Japan in April 2001. It includes the regular 14 track CD album, but without the bonus video track of "Summer Moved On", plus a bonus CD which includes Take On Me (album version), the "radio version" of "The Sun Never Shone That Day" (3:30) (not the four different remixes which were initially promised) plus the videos of Summer Moved On, Minor Earth Major Sky, Velvet and Take On Me (all in QuickTime format). The videos can be viewed from a special "Launch Centre". The front and back covers of the album are identical to the regular edition, but there is a large obi strip which covers the front sleeve, spine and half of the back sleeve. 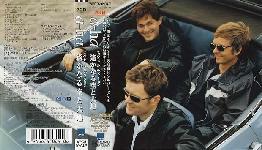 It features the picture of a-ha sitting inside an open top car, as printed in the booklet of the regular CD release. The title and track information is printed in white and black Japanese text. The album comes with a different Japanese lyric-sheet, which states that it is a "special edition" and with details of the second disc. Disc 1 is identical to the disc of the regular release except for the obvious absence of the Quicktime logo. Disc 2 is of similar layout to disc 1. The promo edition of this two disc release has &qquot;sample - loaned" etched in orange around the centre of the disc and has a white not for sale sticker with red text stuck over the barcode on the back of the obi. There were two different promo cassettes of "Minor earth, major sky" in Japan. Both of them come with blue paper title sleeves with the title is printed at the top and tracks listed underneath. The first of the two was released in 2000 and has the following text printed at the bottom of the sleeve: "2000.5.10 on sale" plus the official WEA-Number (WPCR-10688). The second of the two was released in 2001 and has "2001.4.25 on sale" printed on it plus the official WEA number (WPCR-10934,35). Both editions have "Sample Tape For Promotion Only" printed on them and the WEA logo in the bottom left hand corner. Both cassettes are transparent with blue labels on which black text is printed. The remix of "Summer Moved On" is track 14 on both cassettes. The 2001.4.25-version is a special edition and includes two bonus tracks - "Take On Me" and "The Sun Never Shone That Day" (Radio Version) on 'disc 2'. This cassette has a slightly darker blue sleeve than the first, it also has a spelling mistake as "Barely Hanging On" is printed as "Varely Hanging On"! The track list is printed in both English and Japanese on the 2001 cassette and the cassette insert opens out. The Korean cassette comes with the same front cover as the European edition. The layout and colouring on the spine is slightly different; being darker and has the title "a-ha minor earth | major sky" displayed in both English and Korean. At the bottom of the spine, the blue "WARNER MUSIC KOREA" logo and shortened Catalogue number 82183-4, printed in black are included. The insert folds out to show an extra black backgrounded section on each side, displaying some additional Korean information about the history of a-ha and its album discography release dates. The layout of the back sleeve is again very similar to the European edition, it comes with the usual full track listing printed in white, standard barcode and full Catalogue number 8573 82183-4 • WE 491. The regular Production and Copyright information in both English and German is also displayed. Additionally at the bottom of the back sleeve is the Manufacturing information which has been amended to include most of the text in Korean, it also shows "Made in Korea", plus the date the album was released; "(00.4.20)" and a Production date; "2000-354 (00.4.14)". The actual tape itself is white with black stickered labels and white printed text. The title is displayed in English along the top using the same layout and design of that on the front cover and spine. The "WARNER MUSIC KOREA" logo is also included on the left hand side with Side "A" or "B" on the right. Along the bottom of each side is some Distributing and Manufacturing information; "DISTRIBUTED BY WARNER MUSIC KOREA LTD. A WARNER MUSIC GROUP COMPANY. MANUFACTURED BY HWA EUM RECORDS CO., LTD. REGISTRATION NO. 275 TO THE MINISTRY OF CULTURE & TOURISM". The tape also additionally includes a Silver "Warner Music" logo displayed in-between the cogs on both sides. The Malaysian CD is similar to the European release but comes with some additional Malaysian manufacturing text under the barcode on the back sleeve; "℗ & © 2000 WEA RECORDS Warner Music Germany • A Warner Music Group Company. All rights reserved. Unauthorized duplication is a violation of applicable laws. Manufactured and Marketed by Warner Music (Malaysia) Sdn Bhd, 9th Floor, MUI Plaza, Jalan P. Ramlee, 50250 Kuala Lumpur". The front sleeve also includes a blue and white "RIM" sticker on the front of the booklet. The spine of the album differs from the European release in that it is white with the text in black rather than a continuation of the cover artwork. The disc itself is also virtually the same as the European release but the "wea" logo on the left hand side includes some revised text to include "Made in Malaysia" rather than "Made in Germany". Around the bottom outer edge of the disc is the regular Copyright information which has only been printed and displayed in English rather than including the French and German translations, it reads; "ALL RIGHTS OF THE PRODUCER AND OF THE OWNER OF THE WORK REPRODUCED RESERVED. UNAUTHORIZED COPING, HIRING, LENDING, PUBLIC PERFORMANCE AND BROADCASTING OF THIS RECORD PROHIBITED". The catalogue number 8573 82183-2 // WE 833 and inner track lyric booklet displaying the usual artworks is otherwise the same. "Minor Earth | Major Sky" was available on cassette in Malaysia. It is similar to the European release, but comes with some additional Malaysian Manufacturing and Marketing text printed on the back sleeve; "Manufactured & Marketed by Warner Music (Malaysia) Sdn Bhd, 9th Floor, MUI Plaza, Jalan P. Ramlee. 50250 Kuala Lumpur". There is also a blue and white official "RIM"sticker on the front cover. The tape is clear transparent with a grey centre and white printed text. 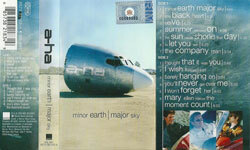 The title "A-HA - MINOR EARTH MAJOR SKY" is displayed along the top with the track listing to each side displayed underneath but set out differently compared to the European release. The "wea" logo is included on the left hand side, with Side 1/2 and Catalogue number 8573-82183-4 shown on the right hand side. Along the bottom of Side 1 is some Production information; "(P) 2000 WEA RECORDS WARNER MUSIC GERMANY GMBH A WARNER MUSIC GROUP COMPANY", whilst along the bottom of side 2 is instead some Copyright text; "ALL RIGHTS RESERVED. UNAUTHORIZED DUPLICATION IS A VIOLATION OF APPLICABLE LAWS". Additionally engraved into the centre plastic in between the cogs of the tape on both sides and on the reverse of the cassette case is the "Warner Music Europe" logo. Mexico: The Mexican CD release comes with an additional "FLAPF" silver hologram sticker on the front of the CD case and includes a different catalogue number "821832 5" displayed on the spine and actual disc. The front and back cover sleeves feature the regular colour artworks but include some Spanish manufacturing and copyright information under the barcode on the back sleeve; "MAY IMPORTANTE Este fonograma es una obra intelectual protegidas en favor de su productor Derechos protegidos ℗ © 2000 WEA RECORDS. Warner Music Germany . A Warner Music Group Company. DERECHOS RESERVADOS La titularidad de los derechos contenidos en este fonograma se encuentra reconocida y protegida conforme a la Ley. SE PROHIBE SU COPIA O REPRODUCCION PARCIAL O TOTAL. AUN DE CARACTER PRIVADO. SU ALQUILER Y SU EJECUCION PUBLICA POR CUALQUIER MEDIO. Estas prohibiciones estan penadas conforme a los articulos 424 Fraccion lll del Codigo Penal y 231 Fraccion III de la Ley Federal del Derecho de Autor y demas normas aplicables, vigentes, incluyendo las de caracter internacional. Hecho en Mexico y distribuido por WARNER MUSIC MEXICO S.A. DE C. V. a WARNER MUSIC GROUP CO. MARCAS REGISTRADAS PARA SU VENTA EN MEXICO. Leibnitz NO. 32. Coi. Nueva Anzures. 11590, Mexico. D.F,: Tel 5729-38-00". The disc was made by "Sonopress" and comes with a similar layout to the European release displaying the light blue and beige colouring, the silver "a-ha" logo is as usual shown at the top with the black full track listing shown in varied fonts and printed in black at the bottom. The regular "wea" logo and production text; "℗ 2000 WEA RECORDS, Warner Music Germany GmbH." is displayed on the left, but doesn’t include the wording "Made in Germany". On the right hand side only the catalogue number and "COMPACT disc DIGITAL AUDIO" logo are shown. Around the bottom outer edge of the disc is some Spanish Manufacturing and Copyright information; "HECHO EN MEXICO Y DISTRIBUIDO POR WARNER MUSIC MEXICO, S.A. DE C.V. A WARNER MUSIC GROUP CO. PROHIBIDA LA REPRODUCCION Y RADIODIFUSION DE ESTE FONOGRAMA, RESERVADOS TODOS LOS DERECHOS DEL. PRODUCTOR FONOGRAFICO". The inside of the CD also includes the same colour lyric booklet as the European release apart from the catalogue number on the back cover has been changed to "821832 5". The Polish cassette comes with the same folded insert as the German release but includes an additional square silver "ZPAV-ZAIKS" Compact Disc/Cassette Tape Hologram sticker on the front cover. The actual tape is transparent clear with a grey centre piece and white printed text, the layout and design differs compared to the German release. The title along the top has been printed and displayed along the same lines as on the front cover. On the left hand side, the "wea" and "WARNER MUSIC" logos are shown. Whilst on the right hand side, it displays; "SIDE A/B", Catalogue number WE 491 8573 82183-4, "DOLBY STEREO" logo and "BIEM/GEMA/ZAIKS" text. Along the bottom of both sides is some Copyright and Manufacturing information; "ALL RIGHTS OF THE PRODUCER AND OF THE OWNER OF THE OWNER OF THE WORK REPRODUCED RESERVED. UNAUTHORIZED COPYING, HIRING, LENDING, PUBLIC PERFORMANCE AND BROADCASTING OF THIS RECORDING PROHIBITED. MANUFACTURED BY TAKT 146/FV". This Special Russian edition of "Minor Earth Major Sky" comes in a card slipcase. The front and reverse of the slipcase and CD sleeve are of similar design to the regular European release. One difference is that the track lengths shown on this Russian release are 1 or 2 seconds shorter than those given on the European release. There is a sticker on the front on the slipcase which reads "Special Russian Edition featuring hit singles "Minor Earth Major Sky" "Velvet" "Summer Moved On" plus 2 bonus tracks". The bonus tracks featured are: Minor Earth Major Sky (Black Dog Mix) and Velvet (Stockholm Mix). The Warner Music logo plus some Russian text has been printed on a white oval background on the bottom right hand side of the front of the booklet. The disc itself is similar to the Europen release, but with "Warner Music" printed at the top of the disc. "Minor Earth Major Sky" was re-issued by Никитин in Russia, it is similar to the European release but comes with an obi-strip which features part of the cover artwork with black and white text plus small pictures of the "Lifelines" and "How Can I Sleep With Your Voice In My Head" covers. It also has a "WARNER MUSIC INTERNATIONAL FOR SALE IN RUSSIA" silver Hologram in the bottom right hand corner of the front cover. The original Russian cassette of "minor earth | major sky" was released by "Soyuz Music (СОЮЗ)" and comes with a similar front and back sleeve to the European edition. On the back sleeve (and spine) there is no Catalogue number printed in white above the barcode and the regular German manufacturing information has been amended to include some Russian text; "℗ & ℗ 2000 WEA RECORDS Warner Music Germany GmbH. A Warner Music Group Company. ℗ & © 2000 Русское издание Концерн <> (Студия СОЮЗ) исключительные права на производство/дистрибьюцию в россии и странах СНГ. All rights reserved. Unauthorized duplication is a violation of applicable laws. Alle Urheberund Leistungsschutzrechte vorbehalten, Kein Verleih! Keine unerlaubte Vervielfaltigung. Auffuhrung. Sendung!". Also included on the back sleeve and displayed at the bottom of the spine are the regular black "wea" logo and an additional red and white "Soyuz Music (СОЮЗ)" logo. The Russian Registered Trademark text; "зарегистрированные торговые знаки" is also shown on the back sleeve only. The inside of the insert folds-out to display the usual European artwork picture showing the three band members sitting in a car with the regular album credits printed in white. The tape is clear with outer red cogs and white printed text. 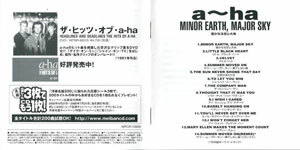 The title "A-HA/MINOR EARTH/MAJOR SKY" is displayed along the top with the track listing to each side shown underneath. On the left hand side, it includes Side 1 or 2, square "wea" logo and Catalogue number 85738-2183-4, with the "Soyuz Music (СОЮЗ)" and "Euro Star SD" logos shown on the right. Along the bottom in the left hand corner it displays "DIGITAL MASTER", with "DOLBY HX PRO" being shown in the bottom right hand corner. There is also some Russian Copyright and Production text printed at the bottom centre of side 1 which reads; "Русское издание Концерн "Группа Союз" (Студия СОЮЗ). все права защищены", whilst at the bottom centre of Side 2 the regular "WEA" Record Company Copyright and Production text has been instead included and printed in English; "© & ℗ 2000 WEA RECORDS Warner Music Germany GmbH. A Warner Music Group". The Catalogue number is displayed differently compared to the European edition and reads; 85738-2183-4. There is another Russian Cassette release of "Minor Earth Major Sky" which was re-issued in 2001 by "Никитин", it is similar to the earlier "Soyuz Music (СОЮЗ)" 2000 release, but like the European edition, the Catalogue number this time has been included on the back sleeve and on the actual spine. On the back sleeve, the colouring of the artworks is rather greenish compared to the regular blue, plus the Production and Copyright information has been amended to include some further Russian text and contact details; "℗ & ℗ 2001 WEA RECORDS Warner Music Germany GmbH. A Warner Music Group Company. All rights reserved. Unauthorized duplication is a violation of applicable laws. Alle Urheber-und Leistungsschutzrechte vorbehalten. Kein Verleih! Keine unerlaubte Vervielfaltigung. Auffuhrung, Sendung!. "℗ 2001 фирма грамэаписи НИКИТИН / www.records e-mail: [email protected] Тел./ф. : (095) 310-10-76 Эксклюэивный Дистрибьютер MC. CD в России/СНГ: Торговая Фирма НИКИТИН e-mail: [email protected] Тел./ф. : (095) 381-66-05". There is no red and white "Soyuz Music (СОЮЗ)" logo displayed on the back sleeve nor on the spine, but the black "wea" logo is as usual only included at the bottom of the spine. The bottom of the spine also comes with the "www.records.ru" website address and Record Company text; "ФИРМА ГРАМЗАПИСИ НИКИТИН". Like the earlier Russian edition and the European release, the inside of the fold-out insert also comes with the regular European artworks, displaying the three band members sitting in a car, plus the white printed credits information. The tape is transparent clear with red and white cogs and white printed text, the layout and font size of the text differs compared to the earlier Russian "Soyuz Music (СОЮЗ)" edition and the European release. Along the top is the title "a-ha minor earth | major sky" which is printed in the same design as that on the front cover and spine. The track listing to each side is shown underneath, unlike the earlier Russian & European editions; the tracks also include a track number. At the top left hand corner, the "www.records.ru" website logo is displayed, whilst at the top right, the Record Company text; "ФИРМА ГРАМЗАПИСИ НИКИТИН" is shown. The Catalogue Number WE 491 8573 82183-4 and "wea" logo are displayed on the left hand side, with side "A" or "B" on the right hand side. Along the bottom of side A, there is some Russian "НИКИТИН" Manufacturing and Record Company contact details; "℗ 2001 "фирма грамэаписи "НИКИТИН"/ www.records Торговая фирма "НИКИТИН" (095) 381-48-80, 381-66-05". On side B at the bottom, it instead displays; "℗ & © 2000 WEA RECORDS Warner Music Germany GmbH All Rights Reserved". Also included at the bottom of each side of the tape are the "DIGITAL MASTER" and "DOLBY HX PRO" logos. The South African CD release of "Minor Earth Major Sky" was "Made in RSA by CDT and Marketed and distributed by Gallo Record Company", it comes with the regular front and back cover artworks displaying the cockpit on the front with the black title "minor earth | major sky" underneath. The reverse comes as usual with the full track listing printed in white and shown in varied fonts down the left hand side. The three band member’s pictures are included along the bottom. There is also some South African Production and Copyright text shown in white at the bottom right hand corner; "℗ & © 2000 WEA RECORDS Warner Music Germany • A Warner Music Group Company. All rights reserved, Unauthorized duplication is a violation of applicable laws. Marketed and distributed by Gallo Record Company. WICD 5298 K". There is a white barcode on the back sleeve but smaller that on the European release and displays a different number "6 001208 894334", the regular "wea" logo is also shown but along with three other logos; "Gallo Record Company", "A.S.A.M.I SEAL OF APPROVAL Musical Note" and "Das Ende vom Lied COPY KILLS MUSIC". The disc itself is darker than the European release and is coloured sky blue rather than light blue. The beige is also somewhat deeper in colour. The silver a-ha logo is displayed as usual on the top half with the full track listing in varied fonts shown in black at the bottom. The black "wea" logo is included on the left hand side with some Production text; "℗ 2000 WEA RECORDS Warner Music Germany GmbH. Made in RSA by CDT. Marketed and distribted by Gallo Record Company". The Catalogue number WICD 5298, "Gallo Record Company" and "COMPACT disc DIGITAL AUDIO" logos are shown on the right. There is no Copyright text printed around the outer rim of the disc. The release also comes with the regular inner lyric booklet similar to the European edition but has the South African Catalogue number printed instead on the back cover. The album was also released in Taiwan. The regular CD release comes with a white and green obi strip which features black and green text. Limited editions of the album come in a unique card slip case with lyric sheet and poster calendar! The front cover of the slip case is unique, the top half features the picture found on the cover of the regular release, where as the bottom section features a picture of the band sitting inside a car (similar to the one found inside the cassette edition of the European album). 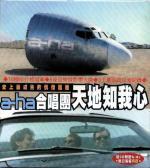 Across the middle of the cover, the a-ha logo is printed in light blue and the title is written in white in Taiwanese text! Additional Taiwanese text is printed in orange above. The reverse of the slip case features a close-up shot of the grey metallic body of the aeroplane nose. Small pictures of a-ha's previous releases (excluding Memorial Beach) are printed across the bottom. Track details and other information is printed over the rest of the sleeve, again in Taiwanese. The spine of the case shows the album title printed in both English and Taiwanese. Inside the slip case are the regular "Taiwan made" album in jewel case (without obi strip), a lyric sheet with lyrics printed in Taiwanese, an advertising sheet showing new releases (including "Minor Earth, Major Sky") and a fold out poster calendar. There are a few minor differences between the German made and Taiwan made CDs. There are obvious text differences relating to country of manufacture, more of the actual disc of the Taiwan release has been printed on (i.e. printing is closer to the centre of the disc), the Taiwan CD booklet uses heavier / thicker paper and the catalogue number has not been printed in the bottom right hand corner of the reverse of the booklet. The poster calendar opens out making it six times the size of a regular CD-booklet. 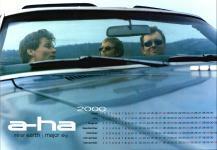 The picture on the poster is the one of a-ha sitting inside a car, as on the front of the slip case. In the bottom right hand corner, there is a calendar for 2000, including only the months June - December. In the bottom left hand corner is a large white a-ha logo and the title in black underneath. This limited edition album may have been re-released, for there exists a similarly packaged album which has an additional sticker of red text stuck over the seal, just above the title on the slip case. Translated, this text reads "No.1 chart at 18 country, 8 items of MTV music awards, 30000000 albums sell"
The CD release comes with the regular front and back cover artworks and includes a blue and white "WARNER MUSIC THAILAND ifp1 500 uาn" sticker at the bottom right hand corner of the CD Case. The back of the CD case also includes another small white rectangular sticker displaying some further Thai printed text in black. On the back sleeve the Manufacturing and Copyright Information has been amended to read; "℗ & © 2000 WEA RECORDS Warner Music Germany • A Warner Music Group Company. All rights reserved. Unauthorized duplication is a violation of applicable laws. Alle Urheber- und Leistungsschutzrechte vorbehalten. Kein Verleih!, Keine unerlaubte Vervielfaltigung, Auffuhrung, Sendung!. Made in Thailand. Manufactured and Distributed by Warner Music Thailand Ltd". The catalogue number has also been slightly changed to 8573 82183-2 // WE 739, plus the "wea" logo, LC04281 coding and "Das Ende von Lied. COPY KILLS MUSIC" symbol are additionally shown. The disc itself is coloured light blue on the upper half and a lighter cream than the European release at the bottom, seperated by a thick black line. The regular silver a-ha logo is shown above the centre ring with the varied full track listing in black below. The usual "wea" logo is displayed on the left hand side with some production text; "℗ 2000 WEA RECORDS, Warner Music Germany GmbH. Made in THAILAND" included. The standard Catalogue number 8573 82183-2, "GIEM/BIEM" and "COMPACT disc DIGITAL AUDIO" logos, plus "LC04281" coding are shown on the right. Around the outer edge of the disc is the exact same Copyright text which appears on the European edition and is printed in English, French and German. The release also comes with the regular lyric booklet. There is also a Thailand promo CD album release which comes with same front and back Thai stickers as the regular release and has "PROMOTION ONLY NOT FOR SALE" in black text printed around the centre ring of the disc. The Thailand cassette comes with a blue and white "WARNER MUSIC THAILAND / ifpi 119 uาn" rectangular sticker on the front of the cassette case. The sleeve is similar to the German release but states that it is "Made in Thailand. Manufactured and Distributed by Warner Music Thailand Ltd". The cassette itself is transparent with a grey centre and white text. The title "A-HA / MINOR EARTH/MAJOR SKY" is displayed along the top with the track listing to each side underneath, but this is set out differently and comes with a different font size. The "wea" logo on the left hand side is larger than on the German release with "side 1/2" on the right hand side being smaller. The Catalogue number shown on the tape has also been shorted to 82183-4. Along the bottom of side 1 there is some Manufacturing and distributing information which reads; "℗ & © 2000 WEA RECORDS. Manufactured and distributed by Warner Music Thailand Ltd". The Catalogue number printed at the bottom of the spine is the same as the German release; 8573 82183-4 WE 491. The Turkish cassette has a similar front cover and folded insert to the European release but the German Manufacturing information on the back sleeve has been replaced instead with some Turkish Record Company contact details; "WEA International Inc. lisansi ile BALET PLAK tarafindan yayinlanmistir. IMC 6. Blok 6645-46 Unkapani / Istanbul Tel : 0212 522 75 85". The tape itself is frosted with a grey centre piece and grey printed text, the layout and design is different compared to the European edition. 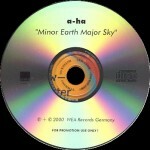 There is a large "a-ha" logo displayed at the top with the title "minor earth / major sky" shown underneath, unlike the European release, there is no full track listings included. On the left hand side, it displays the "wea" logo with some Record Company Production and Copyright text; "℗ & © WEA RECORDS", whilst on the right hand side it shows; "SEE INLAY FOR DETAILS", plus there is some Turkish trademark text; "Her hakki Mahfuzdur. T.M.". Along the bottom of each side is some Catalogue numbered coding which reads; "KB • 2000 • 34 • 0 • 022 8573 82183-4", with the Record Company name "BALET PLAK ve MUZIKASET TICARET" also included. The release also comes with the same Catalogue number 8573 82183-4 as the European edition and is additional printed on both the spine and back sleeve. There is an Ukrainian release by Odyssey which is similar to the European release but the paper has a checkered look to it. There is some additional black Ukrainian text in the bottom right hand corner of the back sleeve. There is also a silver hologram sticker on the back cover with the title of the album in black plus the text "KOHTPONBHA MAPKA" in silver. There are two logos, a round planet of hits globe and a rectangular Odyssey snake logo. In the bottom left hand corner of the front cover there are two blue and yellow rectangular boxes with Ukrainian text. The discs include the additional logos and Ukrainian text. The original Ukrainian cassette was released by "Soyuz Music (СОЮЗ)" and comes with the same folded insert as the Russian "Soyuz Music (СОЮЗ)" release displaying the regular front cover artworks. There is an additional small silver "Euro Star" hologram sticker included on the front sleeve. On the reverse of the sleeve, there is a silver and green stickered stamp partly stuck over the white barcode, with the text "КОНТРОЛЬНА МАРКА" printed in black and "УКРАЇНА UKRAINE" in green. Some other coding "013135" is shown in red. The Russian Manufacturing information has again been included under the white track listing, at the bottom of the sleeve next to the white "wea" logo; "℗ & ℗ 2000 WEA RECORDS Warner Music Germany GmbH. A Warner Music Group Company. ℗ & © 2000 Русское издание Концерн <> (Студия СОЮЗ) исключительные права на производство/дистрибьюцию в россии и странах СНГ. All rights reserved. Unauthorized duplication is a violation of applicable laws. Alle Urheberund Leistungsschutzrechte vorbehalten, Kein Verleih! Keine unerlaubte Vervielfaltigung. Auffuhrung. Sendung!" Like the Russian edition, the regular black "wea" and red and white "Soyuz Music (СОЮЗ)" logos are included on both the spine and back sleeve, with the regular Russian Registered Trademark text; "зарегистрированные торговые знаки" displayed next the barcode on the back sleeve only. 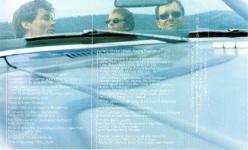 The inside of the insert folds-out to display the usual European artwork picture showing the three band members sitting in a car, with the regular album credits printed in white. The tape itself is clear with a grey centre piece and white printed text, it was Manufactured by "Euro Star" and the layout is somewhat different compared to the Russian "Soyuz Music (СОЮЗ)" tape. There is some Ukrainian text printed along the top; "Світову якість запису купуй під зіркою" which appears to translate into a slogan; "Buy world-class recording quality under the star", rather than being the album title; "Minor Earth Major Sky". On the left hand side, it includes a large "СОЮЗ" logo with side A/B and a rounded "leaf" style logo plus coding; "УкрЦСМ-9868" being shown on the right. In-between the cogs on each side is also a "Euro Star" logo. Along the bottom in the left hand corner it displays "DIGITAL MASTER", with "DOLBY HX PRO" being shown in the bottom right hand corner. There is also some Ukrainian Copyright information printed at the bottom centre of each side, with an additional website and contact email address included; "ВСІ ПРАВА ДОТРИМАНО НЕСАНКЦІОНОВАНЕ КОПІЮВАННЯ ТА ПУБЛІУНА ТРАНСЛЯЦІЯ ЗАБОРОНЕНІ ВИРОБЛЕНО В УКРАЇНІ КОМПАНІЄЮ "КИЇВ-ЄВРОСТАР" ПО ЛІЦЕНЗІЇ "АРТСТАРЗ СТУДИЯ СОЮЗ" WWW.EUROSTAR.KIEV.UA: E-MAIL. [email protected]". The cassette and sleeve appears to come without a printed Catalogue number. There is also a Ukrainian "никитин" cassette release of "Minor Earth | Major Sky" which is similar to the Russian "никитин" reissue release and includes the regular front and back cover insert displaying the same Russian Record Company details on the back sleeve; "℗ & ℗ 2000 WEA RECORDS Warner Music Germany GmbH. A Warner Music Group Company. All rights reserved. Unauthorized duplication is a violation of applicable laws. Alle Urheber- und Leistungsschutzrechte vorbehalten. Kein Verleih! Keine unerlaubte Vervielfaltigung, Auffuhrung, Sendung! ℗ 2001 фирма г рамэаписи никитин /www.records e-mail: [email protected] ТЕЛ./ф. : (095) 310-10-76. эксклюзивной дистрибьютер MC, CD в россии/снг: торговая фирма никитин e-mail: [email protected] ТЕЛ./ф. : (095) 381-66-05". There is an additional silver "КОНТРОЛЬНА МАРКА" hologram sticker on the front sleeve displaying; A-ha- "Minor Earth- Major Sky" with some coding "A 305376 БР" in black. The tape itself is transparent clear with white text and was manufactured by "Euro Star", it comes with a different layout and design compared to the Russian "никитин" tape. 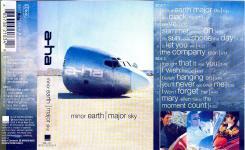 The a-ha logo is displayed in the top centre with the title "minor earth | major sky" underneath. The full track listing to each side is printed in very small lettering and displayed in-between the cassette cogs. At the top left hand corner, the "WWW.RECORDS.RU" website address is shown with the "ФИРМА ГРАМЗАПИСИ никитин" record company logo at the top right. On the left hand side, the "wea" logo and "DOLBY HX PRO" symbol is included along with a shortened Catalogue number 382183-4. On the right hand side, the "EURO STAR" logo, SIDE 1/2 and a circular round leafed logo are shown. Along the bottom, there is some "никитин" Ukrainian record company, copyright information and website addresses; "℗ 2001 ФІРМА ГРАМЗАПИСУ "никитин" ВСІ ПРАВА ДОТРИМАНО НЕСАНКЦІОНОВАНЕ КОПІЮВАННЯ ТА ПУБЛІЧНА ТРАНСЛЯЦІЯ ЗАБОРОНЕНІ ВИРОБЛЕНО В УКРАТНЕ КОМПАНІЄЮ КИІВ-ЄВРОСТАР ПО ЛІЦЕНЗІІ "ФІРМА ГРАМЗАПИСУ никитин" WWW.EUROSTAR.KIEV.UA E-MAIL [email protected] [email protected]". Canada promo Minor Earth | Major Sky ?